This colossal stone sculpture rises from the earth in an ultra-remote area of the Niger’s Tenere Desert. The work is a touching commemoration to a plane crash that occurred on September 19, 1989 as a result of a terrorist attack. Parts of the airplane remained scattered across the desert for almost three decades, until a group formed by families of the 170 victims of the crash (Les familles de l’attentat du DC-10 d’ UTA) created the monument on site as a tribute. 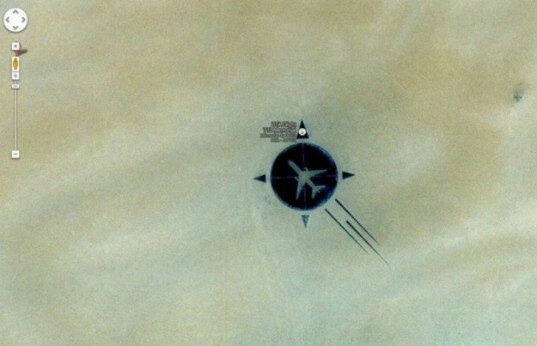 Using stones and debris collected from the desert, members of the association forged the shape of a massive airplane within a 200-foot diameter compass that is even visible from Google Earth. Each of the victims are individually represented through the 170 broken mirrors that make up the radial form of the monument. In the center is an upright plane wing that appears to burst from the sand. A plaque bears each of the deceased’s names, ages, and country of origin. As the site is so remote, the association wanted to build a memorial that could be seen from above. This way the commemoration can be visited at any time by any one in the world using the coordinates 16°51′53″N 11°57′13″E. In the center an upright plane wing appears to burst from the sand. 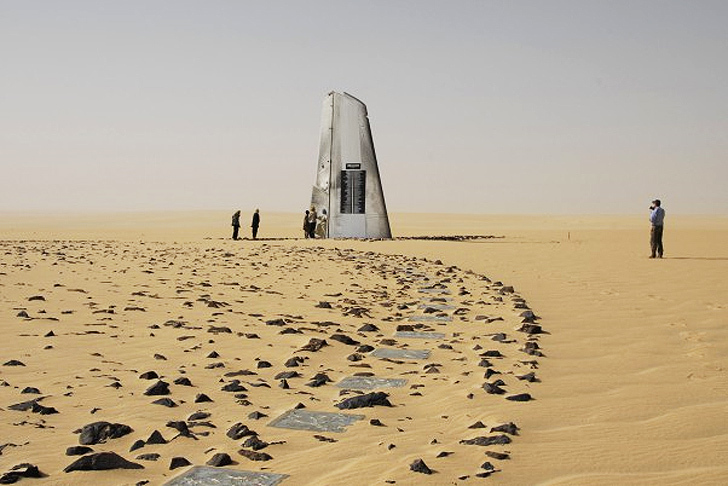 The monument can be found using the coordinates 16°51′53″N 11°57′13″E. Each of the victims are individually represented using 170 broken mirrors. These make up the radial form of the monument. Here a plaque bears each of the deceased's names, ages, and country of origin. As the site is so remote, the association wanted to build a memorial that could be seen from above. This way the commemoration can be visited at any time. The Tenere region is located in the Sahara desert. The memorial was finished in 2007. The victims were from 18 different countries. Stones make up the majority of the monument. Families of the victims went to the site to create the tribute.